Former Federal Reserve Chairman Alan Greenspan is again trying to spook financial markets. On Thursday, he turned his attention to the sub prime market. He declared that there was a risk that rising defaults in sub prime mortgage could spill over into other sectors. Greenspan conceded that it was "hard to find any such evidence" about spillovers from housing yet, but he added, "You can't take 10 percent out of mortgage originations without some impact." Greenspan felt that the downturn in U.S. housing markets stemmed more from high housing prices than from a decline in mortgage quality. For a few weeks now, Greenspan has been pouring out doom and gloom about the US economy. Previously, he announced that a recession by the end of this year was possible, undermining the soothing words of his successor – Ben Bernanke – who is busy talking the US economy up. 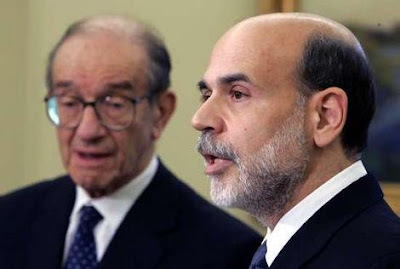 Sadly, Greenspan does appear to be right. Increasingly, US macroeconomic data is pointing towards a major slowdown in activity. However, Greenspan is not prepared to take any responsibility for his role in the deteriorating economic prospects for the US economy. He was the Fed Chairman when interest rates were slashed to just one percent. He was in charge when housing prices soared, and sub prime lenders were prepared to borrow money to anyone who could show a beating pulse. He was the man that unleashed the inflationary beast and left it to Bernanke to tie it down with a sustained hike in interest rates. Ultimately, Greenspan is proof that one’s reputation is really just a matter of timing; get out when things are good, and everyone thinks you are a star, but if you hang on when the ship is sinking, then everyone associates you with failure. need to ' was '. US inflation remained uncomfortably firm in February for the second consecutive month, making it very likely that the Federal Reserve will retain its focus on price pressures at its policy meeting next week. Core consumer price inflation _ excluding volatile food and energy costs _ eased a fraction to 0.24 per cent in February, while headline inflation was also higher than expected. Monthly inflation numbers are volatile but, with producer prices also stronger this week, the Fed will be concerned that the apparent easing in inflation pressures in the final quarter of 2006 has not carried through into the first quarter of this year. This is likely to leave Fed policymakers reluctant to ease their stance, in spite of market concerns on growth. Goldman Sachs said the inflation report was "slightly worrying". Haseeb Ahmed, an economist at JP Morgan, said the figures "highlight an inflation problem for the Fed". Headline inflation picked up pace with a rise of 0.4 per cent, led by a 4.7 per cent increase in the cost of fruit and vegetables. Energy costs were 0.9 per cent higher after a decline of 1.5 per cent the previous month. Rents and imputed rents for owner-occupiers remained strong, significant, because many inside and outside the Fed have raised hopes that easing rents would eventually help cool inflation. As yet, there is very little evidence that this is happening. John Ryding, economist at Bear Stearns, said: "We still expect the Fed to maintain its inflation bias in the policy statement that will be released on March 21." A separate survey showed a drop in consumer confidence among wealthier Americans that analysts said might be attributable to recent market volatility and a crisis in the subprime mortgage market. US markets have experienced a wild ride in recent weeks amid economic anxieties fuelled by the collapse of mortgage lenders exposed to rising defaults on high-risk home loans. The University of Michigan consumer sentiment index for March slipped to 88.8 from 91.3 in the previous month, with the biggest drop among more affluent households.